Hannity spent all of last night's show promoting the movie. He played clips and hosted some of the interviewees along with its principals David Bossie and Steve Bannon. Producer Bossie is not just president of Citizens United, but he seems to have spent the Clinton years in dogged pursuit of any dirt he could dig up and throw at them. Steve Bannon, writer and director, is now executive chairman of Breitbart.com – that fine organization that gave us the recycled “Obama race video” exposing whom Obama briefly hugged in 1990. 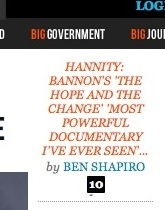 Hannity’s gushing about the film just happened to get his name into Breitbart’s homepage headlines. What’s important is that all of the people who appear in this film – who are, again, Democrats and independents – no Republicans and no conservatives, no Tea Party people – these are people who were in the middle or, you know, conservative Democrats or moderate Democrats, but they believed… they invested a great deal of hope… Really shocking is hearing their own words (of disappointment with President Obama). It seems “terrorist connections” was part of Caddell’s language – because he made no objection to Bossie making such a statement. Hi, Steve M! Very interesting about Caddell and Hunter Thompson. He (Caddell) certainly seems to have taken some bizarro detour. By the way, everybody, Steve has a blog I recommend, called No More Mister Nice Blog. It’s on our blogroll. Whoa — take a breath, girl! Um, Emmanuel is no longer employed by the Obama Administration — and Ayers never was . . .
Um, that began in the Dumbya administration as Project Gunrunner . . .
Um, the Dumbya Justice Department did that . . .
Um, there is no US military action in either country . . . The documentary I want to see is the one of Hannity getting waterboarded. Really, Hannity? The most powerful documentary you’ve ever seen in your life. Did you ever see Shoah? Obama has spent 4% of his time as President on the economy & jobs and spent about 60% campaigning or events look at Obama own daily schedule off his own website. http://www.whitehouse.gov/schedule/president/2012-07-16 . Obama is the most corrupt President we have ever had! I think he is our very own Celebrity and Thief. His whole Presidency has been nothing but golfing, basket ball, expensive trips, and celebrity parties and hasn’t done nothing but spend our tax money since he has been President like it is his own money. He has been spending our tax to grease the palms of his supporters since day one…giving it to his investors like Solyndra, Evergreen Solar, Amonix Inc., GE, JP Morgan Chase, Goldman Sachs, Tides Foundation, Exelon Corporation, and many others. These are also Obama donors: John Doerrâs venture capital firm, Kleiner Perkins Caufield & Byers, Daniel Weissâ Angeleno Group LLC, Theodore Dimon, and Steve Westlyâs eponymous Westly Group, SEIU, and GE, which in return they give back contributions to his past and present campaign. Also, this is truly criminal and Obama should be in prison for stealing billions of our tax money to butter the palms of David Axelrod, Rahm Emmanual, and Bill Ayers. Obama has been funneling money through an Illinois-based energy producer Exelon Corporation to these people and other’s who have helped his candidacy and his reelection bid. They are bundlers for Obama and our tax money is being used to make his friends rich. Obutthead is a disgrace! He needs to be in prison for several things like: “Fast and Furious” Gun running which concluded in a board patrol’s murder and then covering it up; Intimating our US Supreme Justices to vote his way on two cases Heath Care Bill and Voter ID laws; Sweeping Black Panther’s voter intimidation case under the table; Starting two Wars in Syria and Yemen without Congressional approval; Leaking US intelligence to the media for improving his image and making his movie. These offenses are all either Impeachable offenses against our Constitution and he should be in prison for cover up’s and he and his administration lying during Congressional hearings. Obamaâs very major scandals are getting much airplay or print space in the legacy media. With all the cover-up the mainstream media did in the run-up to the 2008 election and continue to do, they can ill afford to stop now because they know if Obama goes down in a major scandal of such huge criminally corrupt proportions, he takes them down with him. And the Democrat Party becomes a 40-year minority party â if it survives all the scandals. So the lamestream media has to continue to cover up all the thuggish activities, all the obstruction of justice, all the kickbacks, all the pay-to-play, all the corruption that is the Obama administration. This was another desperation move for Hannity, who is becoming more and more unhinged about how the election season is going. By his own countdown, Romney has less and less time to overcome his popularity deficit, and Hannity is seeing the writing on the wall. Cherry picking a few conservative Dems and conservative independents (including one who admitted they would have voted GOP but were angry at the McCain ticket) to say smack about Obama does not constitute good research. If this is the best Hannity can come up with, Romney’s in much worse trouble than I previously thought. Only on Planet Wingnut is someone who serves in the nation’s highest elective office, lives in a house with no privacy, and has a media pool dedicated to reporting on him daily, “hiding behind the veil of obfuscation” . . .
Sean Hannity was so eager to promote it that he announced, âThis is the most powerful documentary Iâve ever seen in my life." Even better than “The Undefeated”, Sean? Thanks for the heads-up. Must see "The Hope and the Change’. Obama has hidden behind the veil of obfuscation for too long, hovered over & shrouded by his media minions. Wanker Pat hasn’t been a Democrat for over thirty years. Presidents Clinton and Obama dismissed him as a pretentious clown who will say anything for the right price. Obviously, Jabba T. Ailes and Fux Noise know what that price is. Caddell used to hang out with Hunter Thompson. I didn’t agree with everything Thompson said or did and he’d certainly fried his brains by the end of his life, but there’s no way he would have looked at Murdoch, Ailes, the Kochs, Romney, Ryan, and the rest of this crowd (the GOP primary field!) and had anything good to say about any of them.